Many Honors students who spend time abroad or off campus doing the Honors Course Substitution option put together captivating journals that are just too good not to share. So we’ve decided to introduce an ‘Abroad Experience’ feature to our blog. Every so often we’ll publish an excerpt from a student journal as a snapshot of their experiences off campus. Our very first piece introduces Honors student Meng Shui, who spent Spring 2011 in London. Here is just one entry from her stunning journal. Look for more updates in the coming weeks! Being in London for two months, Yaya, my lovely Taiwanese flatmate, has totally adopted the English tea culture and visits Piccadilly shops every week to try all kind of teas and macaroons. So yesterday I thought, maybe I should do that too, just to get more Englishness out of my London experience. So I went to get tea at Fortnum & Mason and macaroons from Laduree. When I stepped out of the shop and turned left passing the entrance of the Royal Academy, I saw a man lying on the ground. Another poor homeless person, I thought–there was always one with a dog outside of Notting Hill Gate every day when I went home. Looking to see if this one had a dog too, I put my hand in my pocket to reach for some coins.Then I realized that he was doing something strange. There were some spots of bright colors near the brown–wired head that was almost touching the ground.  As that head moved a little bit, I saw a box filled with paints and brushes, and looking closer to the color spots, I saw little images. “No way!” I expressed my astonishment in an adopted American way. He stopped and his head slightly turned toward my feet. “Oh my God!” I said again, realizing who he might be as he finally turned his head and looked at me. “You are the artist who paints chewing gums on the street!” I said and he smiled. I swear he smiled the widest, brightest, happiest and kindest smile I have ever seen in the city of high heels and black coats. “Yeah, I’m the chewing gum man,” he said, still smiling. His teeth were small and yellow, but the smile was even better than those of William and Kate on the bizarre postcards in every souvenir store. “I’ve seen your works on the Internet,” I said, so excited, “They are such sweet things! I absolutely love them!” “Oh, thanks, I’m glad you like them.” I didn’t know what to say next so I asked if I could take a photo with him, which I did and then left with great surprise and amazement. I know it seems confusing, but the story goes like this. Last semester, as a graphic design student who had to make up some product to design packages for, I decided to invent a chewing gum that has natural ingredients that would up-lift your mood and make you happy. Why? Because people are not happy in general, especially in a city that snows six months a year, and they chew chewing gum all the time. I called it “happi” and the slogan was “Get Happi!” Unfortunately there is no such simple solution to human suffering, just as Syracuse is still snowing at the end of April and people are still miserable. 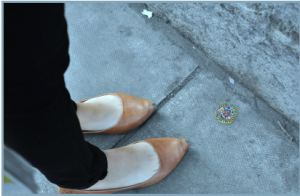 But as I was researching everything about chewing gum, I learned about an artist who creates miniature paintings on chewing gums that stuck to the pavement. His works were so small, so detailed and so lovely that everyone who saw them loved them and felt happy. They work better than my imaginary chewing gums. And of course, at that point in my life, I did not know this artist was in London, just like I had no idea I would come to London and find him on the street like a homeless person! After we said goodbye, I still thought he was homeless and I did not return and offer him my macaroons only because someone else had stopped to talk to him. I mean, come on! 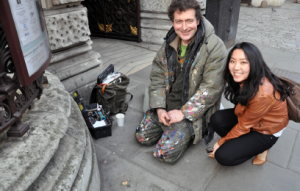 Yes he is an artist, but no one makes money from painting chewing gums, so he’s very likely be a homeless artist. At night, with the tea that did not taste better just because it’s more expensive and the macaroons that were way too sweet for me to afford or to eat, I uploaded the pictures of painted chewing gums to Facebook. Description, “I wanna go back and take pictures of all the little gums this guy has painted!” And I think that’s what I’m going to do!